It happened in our local IMAX Theater at Regal Pinnacle 18 in Turkey Creek. I sat for nearly three hours in a trance, literally glued to the screen, delighted, touched, happy, often with goose bumps, sometimes confused, mostly amazed. Christopher Nolan, acclaimed director of “The Dark Knight Trilogy” and “Inception” (2010) has done it again. He has made a visual spectacle powered by emotion and creativity to the point that the awe we see in the visual effects is overridden by feeling. 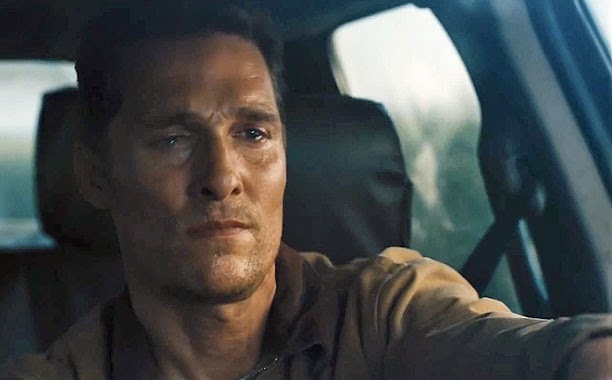 In “Interstellar,” Matthew McConaughey plays a man named Coop, a farmer in a near-future America devastated by drought and famine. He lives in a farmhouse with his two young children, Tom (Timothee Chalamet) and Murph (Mackenzie Foy). He has nightmares from his former life as a NASA pilot. In this future, there is no need for things like space exploration. In school, the children are taught to be “caretakers” of the Earth, not scientists. Farming is pretty much all there is. The only crop left is corn. Dust falls from the sky like rain. The message is a set of coordinates leading to the best-kept secret this crumbling world…NASA, which is still functioning under the leadership of Coop’s former teacher, Professor Brand (Michael Caine), who has a theory that if they can figure out the gravitational elements of a “black hole,” then maybe they can send what’s left of Earth’s population to a new home among the stars. A team of physicists has been hard at work for the last decade or longer with the news of a wormhole near the planet Saturn. A handful of astronauts have been sent to explore planets in another galaxy in hopes of finding one that might support human life. Earth, it is well known, will not last much longer. Being one of the best-trained pilots alive, Coop is enlisted to go on a mission to find these astronauts, to see what they found. The mission is half exploration, half search and rescue. His team is the professor’s physicist daughter, Brand (Anne Hathaway), two more scientists, Doyle (Wes Bentley) and Romilly (David Gyasi), and two former-Marine robots named TARS and CASE. What await them out there are surprises that can’t even be hinted at. I can only say that the genius and imagination behind this movie must be experienced by each individual and left for us to argue and ponder. 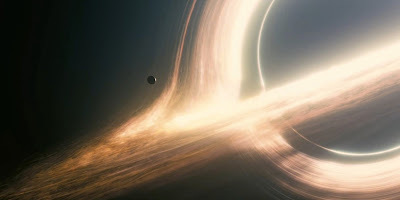 Throughout “Interstellar,” time is discussed, relativity, quantum mechanics, wormholes, black holes, galaxies, dimensions. To be clear, stuff that is way over my head, which may be what keeps this movie from perfection to me. It sure is close though, despite that. And the performances from McConaughey and Hathaway are above and beyond what a movie like this usually expects, which makes the confusing themes and ideas work. Nolan is an expert at IMAX by now. He has made three of the best IMAX experiences I’ve had. “Interstellar” is the fourth. Don’t attempt to see this movie any other way. It’s worth the extra $7. First. The sound. This movie is loud. I felt like I was in that spaceship flying at untold levels of speed. You are in this movie. You can feel its vibrations. However, at certain points, composer Hans Zimmer’s intense musical cues and other sound effects take away from the dialogue. This may be on purpose but can be distracting. Nolan’s “The Dark Knight Rises” (2012) fumbled on this at times as well. Second. The visuals. There are two scenes in this movie, one early in its second act, and one near the last, in which a spacecraft docks with a rotating station. The blend of special effects and live action cinematography is just perfect. The music in the earlier scene gives a slight nod to Stanley Kubrick’s space masterpiece, “2001: A Space Odyssey” (1968). I got chills. Likewise, the wormhole, black hole, flying into the unknown stuff is just creativity and imagination at its finest. It is breathtaking to look at and shocking to think about. Which brings me back to time. 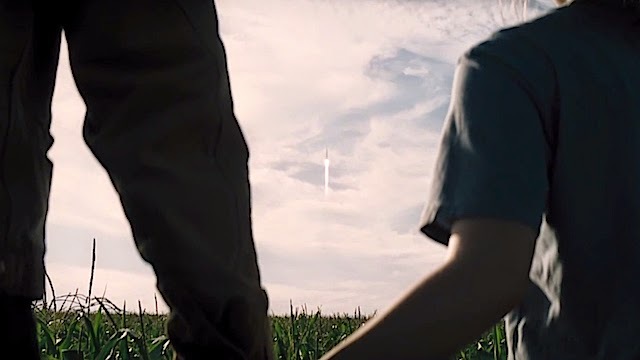 As I watched “Interstellar,” I felt as if time was standing still. This movie covers minutes, hours (for some), decades (for others), then comes back around again. It asks questions that urge us to think about what might be out there, somewhere. With the introduction of an older Murph, played by Jessica Chastain, the question of time goes even further and a connection is made to a similar sci-fi extravaganza in Robert Zemeckis’ “Contact” (1997), also starring Matthew McConaughey. Many of the conversations between McConaughy’s Coop and Hathaway’s Brand reminded me of Kurt Vonnegut’s time-bending sci-fi, WWII novel “Slaughterhouse-Five” (1969). In the novel, an alien species from the planet Tralfamadore see time as a never-ending loop and believe that “All moments, past, present and future, always have existed, always will exist…It is just an illusion we have here on Earth that one moment follows another one, like beads on a string, and that once a moment is gone it is gone forever.” These are the ultimate question of Christopher Nolan’s “Interstellar.” Are there places out there where time doesn’t matter? Can we be in the past, present, and future all at the same time? I’ve always found questions like this fascinating, even if hard to comprehend. I applaud artists who strive to theorize on these ideas. “Interstellar” works on many levels. It is one of the best movies of its kind yet made, though, for me, it doesn’t hold as much weight as Kubrick’s “2001” or even Zemeckis’ “Contact.” No matter. We need movies like this because, above all, they remind us that the things that limit us here on Earth most likely don’t out there, somewhere. We can harness space, and even time, if we work at it. We don’t have to be stuck.